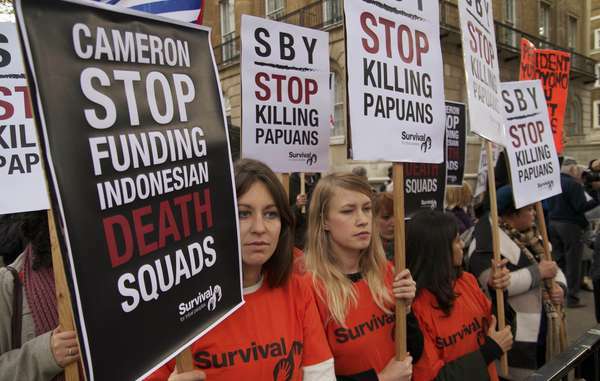 A demonstration by Survival International and dozens of human rights protesters has marred the start of Indonesia’s first state visit to London in 33 years. 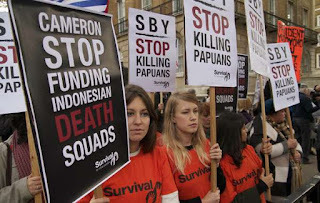 Protesters held banners and chanted slogans outside the London residence of Britain’s Prime Minister, in a peaceful rally against Indonesia’s poor human rights record, its brutal repression of tribal people in West Papua, and UK links to a counter-terrorism unit implicated in the murder of independence leaders. Susilo Bambang Yudhoyono (known as SBY) will stay at Buckingham Palace and meet ministers from the UK Parliament during his three-day visit. The rally outside Downing Street attracted campaigners and supporters from Survival, Tapol, Down to Earth, Amnesty International, Christian Solidarity Worldwide, Progressio and Free West Papua. 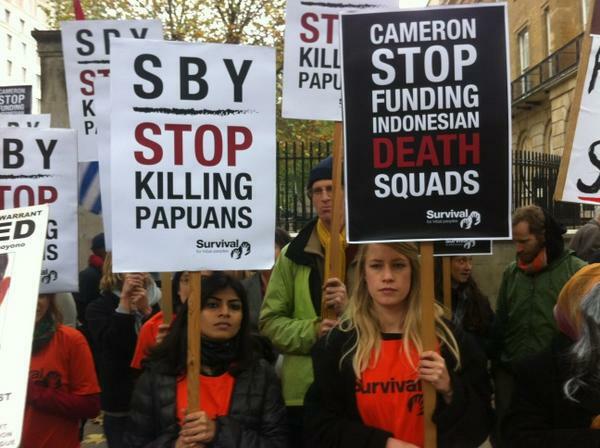 Survival held banners reading, ‘SBY-stop killing Papuans’, and ‘Cameron stop funding Indonesian death squads’. West Papua has been ruled by Indonesia since 1963, and attacks against tribal and indigenous people by security forces are commonplace. 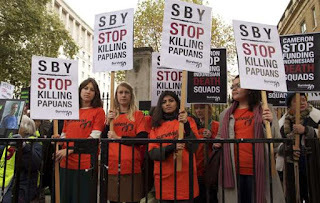 There are also growing concerns surrounding UK links to an Indonesian ‘death squad’, which has been allegedly deployed to suppress violently West Papuans who are peacefully seeking independence.